It takes an average of 3 minutes to stretch a six foot pallet. It takes an average of 1 minute to unwrap a six foot pallet. TOTAL = 4 minutes. Assuming that a company wraps 500 skids a day, 5 days a week, based on 260 and 312 working days a year. Tuck in the tail and secure. STEP #2: How to save 5,198 miles of stretch film year or walking from New York to Los Angeles and back to Chicago! Assuming 6’ 40x48 skid @ 500 per day. The above calculator is only a 12 month analysis. 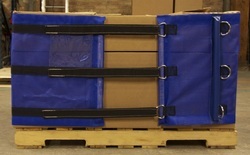 You can use pallet wraps for many years if properly maintained and stored. Click here to see our storage containers.